Whilst working Shintô & shinshintô-kantei volume, I came across a wakizashi by Tsuda Echizen no Kami Sukehiro (津田越前守助広) (No. 254.641, detail of the horimono shown in picture 1) with a kurikara horimono on the omote side of which is assumed that it was not cut by Sukehiro himself but by the horimono-shi Nagasaka Yûhôken (長坂遊鵬軒). This assumption inspired me to do some research on Yûhôken as the reasons for this assumption were not explained any further. Soon in turned out that this was one of the cases where not much info is available. As stated in Haynes (H 12357), I was at least able to find out that Yûhôken carved horimono on Ôsaka-shintô blades. Picture 2: mei “Awataguchi Ikkanshi Tadatsuna Nyûdô – Shôtoku gonen nigatsu kichijitsu – horimono Ikkanshi nanajûyon-sai kore o horu – Yûhôken nanajûsan-sai kore o horu” (粟田口一竿子忠綱入道・正徳五年二月吉日・彫物一竿子七十四歳彫之・遊鵬軒七十三歳彫之). 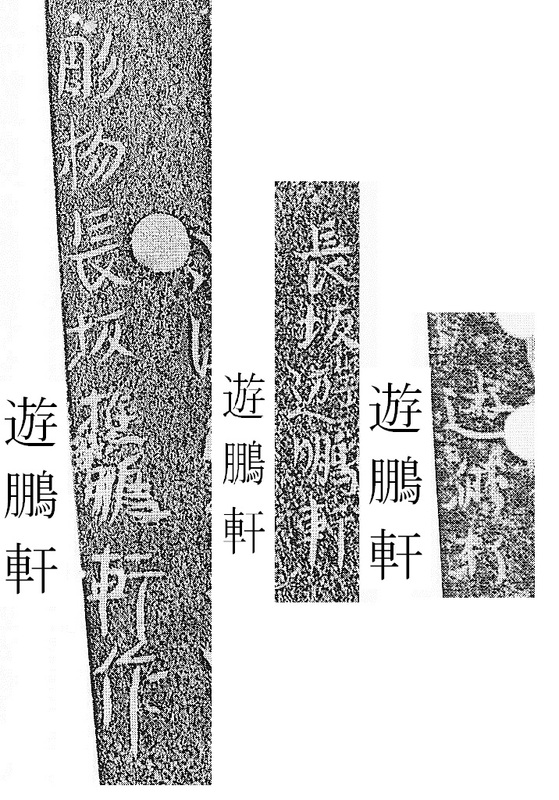 The major reference for Yûhôken´s active period is a blade by Awataguchi Ikkanshi Tadatsuna (粟田口一竿子忠綱) dated Shôtoku five (正徳, 1715) which states in its mei that Tadatsuna was 74 years old at that time and Yûhôken who engraved the horimono 73 (picture 2). From the differences in signature style and from the syntax it seems that both Ikkanshi Tadatsuna and Yûhôken engraved the horimono at a later point in time to the blade, otherwise Tadatsuna would have recorded his engraving as hori-dôsaku in my opinion. Maybe the owner of the blade or maybe his son or grandson approached Tadatsuna and Yûhôken again years later to add fine horimono to the family heirloom. My theory on the later horimono is based on the fact that we know dated blades from Ikkanshi Tadatsuna to Kyôhô twelve (1727). So if he was already 74 in Shôtoku five (1715), he must had been 86 in Kyôhô twelve. Well, possible but rather unlikely, unless the last known dated blade is a daisaku. However, the blade in question tells us that Ikkanshi Tadatsuna and Nagasaka Yûhôken were of the same age. Now to another blade of an Ôsaka-shintô master with a horimono of Yûhôken. It is a wakizashi from Tsuda Sukenao which is shown in picture 3 and which is signed the following way: “Tsuda Ômi no Kami Sukenao – Jôkyô yonnen hachigatsu – horimono Nagasaka Yûhôken saku – Genroku rokunen yongatsu jûsannichi hitotsu-dô Nagasaka Bunzô setsudan” (津田近江守助直・貞享二二年八月・彫物長坂遊鵬軒作・元禄六年四月十三日一胴長坂分蔵切落), “Tsuda Ômi no Kami Sukenao in the eighth month of the fourth month of Jôkyô (1687), horimono by Nagasaka Yûhôken – Nagasaka Bunzô cut with the blade through one body on the 13th day of the fourth month Genroku six (1693)”. Details of the horimono can be seen in picture 4. The interpretation of the kurikara is pretty detailed and unique. Take a look for example at the roundish, wide open eyes, the thickish toes which remind more of paws than claws, and the way the body of the dragon winds in a very vivid way around the sword. Usually the windings of the dragon go in a more uniform way around the ken. Also the lines of the hatahoko are very fluid and represent the fluttering of the standard in the wind pretty good. Another very rare horimono interpretation of Nagasaka Yûhôken can be found in a blade of the Ôsaka-shintô smith Ise no Kami Kuniteru (伊勢守国輝) (picture 5), very rare because it shows a dragon winding around a bamboo and not around a sword! I haven´t seen any other blade with such a horimono yet. Yûhôken states in his signature that he engraved the horimono when he was 70 years old. So we learn that he was well booked in his late years and surely highly respected as great horimono master amongst the local clientel. Speaking of local clientel, we have to become aware of the then differences in Japan´s “metropolises.” I have already mentioned several times that it took some decades after Sekigahara until Edo got off the ground, at least in terms of art and craftsmanship. As we know, the New Sword, the shintô, was born in Kyôto, but rather soon some of the great early shintô masters felt drawn to Ôsaka.Back then, Edo´s produced very little everyday goods so Ôsakaserved first and foremost as a trans-shipment centre for goods collected and produced in Kyôto and shipped to the new capital. With the introduced sankin-kôtai system, soon a constant stream of goods was necessary to entertain the individual fief residences and this forced the establishment of ware and treasure houses. Quite quickly Ôsakabecame the new trade, economy and banking centre of the country. The first highlight of this new style of the Ôsaka-shintô was achieved around Kanbun (寛文, 1661-1673) whereas we can see a noticeable difference in fashion trends. On the one side Edo with the simple and reserved, practically-oriented workmanship, and on the other side the nouveau rich clientele of Ôsaka with their weakness for luxury and ostentation. And this difference in trends is not only reflected in the workmanship but also in the supplements to blades. The Ôsaka merchant-based clientele was tending towards a fine finish with elaborate horimono whereat the mostly warrior-based Edo clientele was much after the results of cuttings tests as we know them in large numbers on blades of Yamato no Kami Yasusada (大和守安定), Izumi no Kami Kaneshige (和泉守兼重), Kazusa no Suke Kaneshige (上総介兼重), or Kotetsu (虎徹). Of course there were also horimono engraved on Edo-shintô blades like by the Shitahara school or cutting tests performed with Ôsaka-shintô blades but the basic trend is obvious. Is picture n°2 missing in this post ? Thanks Paul! Is fixed now.